On 21 October 1786 Mozart's name ("Mozard Capellmeister") appears in the protocol of the k.k. Hofkriegsrat (I. & R. council of war) – of all places. Mozart stood bail for his friend Franz Jacob Freystädtler who was accused of having stolen a piano by the Bavarian captain David Haißer. In the last fifteen years nobody has discovered more handwritten Mozart documents from the composer's lifetime than yours truly. Part of the entry in the protocol of the I. 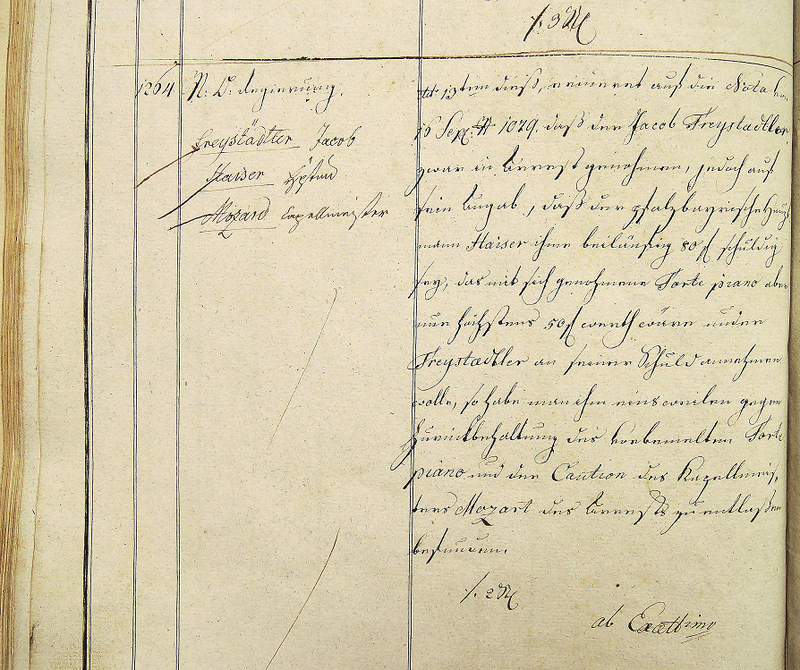 & R. council of war concerning Mozart posting bond for his friend Freystädtler (OeStA, KA, ZSt HKR HR 2026, fol. 1067). The file related to this case does not survive. This discovery was published the article "Mozarts Haftungserklärung für Freystädtler. Eine Chronologie". Mozart-Jahrbuch 1998. Kassel: Bärenreiter, 2000, 1-19. 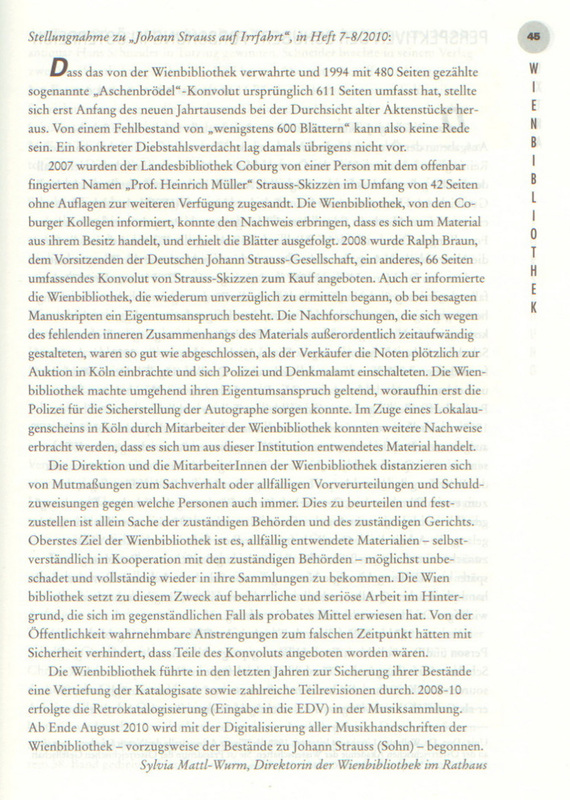 Because Silvia Mattl-Wurm's reply to Frieder Reininghaus' article, "Johann Strauss auf Irrfahrt" ["The Johann Strauss Odyssey"] (in: Österreichische Musikzeitschrift, 65, vol. 9, Vienna 2010, 45) leaves important things unsaid, I wish to add a few points from my perspective as a Schubert scholar and former president of the International Franz Schubert Institute. While the current efforts of the Wienbibliothek to recover stolen Strauss sketches are praiseworthy, it has become evident that these sketches are only the tip of an iceberg, and that the public has not yet been informed of the full extent of the losses suffered by the music collection of the Wienbibliothek (at that time the Wiener Stadt- und Landesbibliothek) prior to the retirement of Ernst Hilmar as head of that collection in 1994. In particular, the estates of Otto Erich Deutsch and Ignaz Weinmann, both owned by the Wienbibliothek, suffered massive losses. Items that were demonstrably in the library as part of Weinmann's estate surfaced in a Viennese antiquarian shop as early as 1993, where they were purchased by the Canadian Schubert scholar Rita Steblin. Steblin (for obvious reasons) did not notify the police, but informed the head of the library, who, however, took no legal action, preferring instead to resolve everything behind the scenes, putatively in the interest of a principle of "confidentiality" that is apparently still in force today. The head of the music collection was suspended and eventually quietly dismissed into retirement. The police and the state prosecutor were not involved. The losses from Weinmann's estate included not only irreplaceable treasures that once belonged to the Krasser family, such as the prayer books of Schubert's sister Therese Schneider and her daughter, but also many other valuable books and a lock of Franz Schubert's hair that had been given to his half-brother Andreas Schubert on the occasion of the composer's first exhumation in 1863. Material from the estate of O. E. Deutsch in the Wienbibliothek also surfaced in the Viennese antiquarian trade. Gitta Deutsch, the daughter of the great Schubert scholar, unsuccessfully tried to awaken the media's interest in these dubious transactions. In 1998 I informed City Councilor Peter Marboe of the alleged thefts – but got no response. In 2000 I informed the head of the Wiener Stadt und Landesbibliothek Dr. Walter Obermaier and his deputy Dr. Gerhard Renner that the missing lock of Schubert's hair from Ignaz Weinmann's estate is now on exhibition at the museum of the Schubert Memorial Site and Museum Atzenbrugg "on loan from Ernst Hilmar" (redated to the year of Schubert's death). I further informed Dr. Obermaier of several facts strongly suggesting that the lost inventory of lenders to the 1897 Schubert exhibition, likewise owned by the library, had also been stolen. 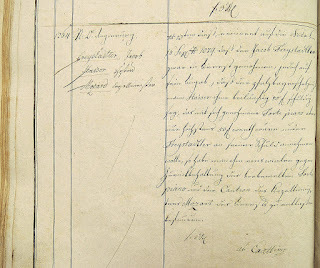 This handwritten register had been described in 1995 in the journal Schubert durch die Brille (edited at the time by Ernst Hilmar) as "having been found in private hands" (Schubert durch die Brille 14, 106). In fact, a copy of a page from this handwritten book had been inserted arbitrarily by Hilmar into one of my articles (Brille 24, 2000, 46). Rita Steblin had seen this precious, leather-bound manuscript in 1993 in the office of the International Franz Schubert Institute (IFSI) in the Kettenbrückengasse, where Hilmar had told her that it could not be given an IFSI stamp, because it "belongs to the Stadtbibliothek". Ernst Hilmar's office in the Kettenbrückengasse in December 1993. The red arrow points to the lost register of lenders to the 1897 Schubert exhibition (photograph by Rita Steblin). The management of the Wienbibliothek began to search for this inventory (which never had been given a shelfmark), but the book could not be found. The police were not notified and no attempt was ever made to recover the stolen lock of hair from Atzenbrugg. Dr. Renner merely asked me every now and then in a humorous tone: "Have you been to Atzenbrugg lately?" 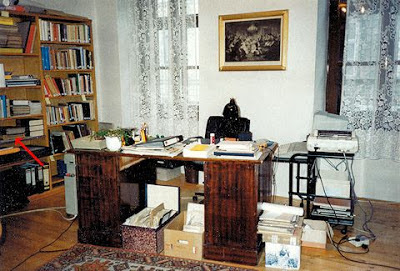 On 6 May 2009 I informed Dr. Silvia Mattl-Wurm of the theft of the lock of Schubert's hair and gave her copies of all my documents pertaining to this unfortunate case, which had now grown far beyond the realm of "speculation and premature judgment". Following this conversation – long before the Strauss affair had become public – no attempt whatsoever was undertaken by the people in charge "to retrieve the stolen material without damage to its collections with the help of the authorities" (as Mattl-Wurm puts it in her statement in the Österreichische Musikzeitschrift). Mattl-Wurm's reply epitomizes the deplorably passive behavior of the Wienbibliothek and its motives: "If we report the theft, it would be more embarrassing for the library than for Hilmar!" If in this affair the police eventually retrieve the stolen goods, we can safely assume that they were not alerted to the theft by the Wienbibliothek. It was certainly no action taken by the representatives of the Wienbibliothek (spun as cunning finesse) that led to the resurfacing of a few of the stolen Strauss manuscripts. It was the stupidity of the thief Ernst Hilmar and his accomplice Werner Bodendorff, and a lucky coincidence, involving the chairman of the German Johann Strauss Society, Ralph Braun. The whole affair is reminiscent of one involving the Vienna City Archive, where between 1969 and 1999 nine leaves were stolen from Beethoven's probate file. Owing to the lack of an inventory it is not even known what exactly went missing and nobody ever reported the theft to the police.